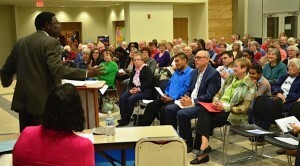 Forty OTOC leaders participated in a candidate forum sponsored by the Interdenominational Ministerial Alliance (IMA) Monday, October 20 at 6:30 pm at the MCC Fort Omaha Campus. IMA asked members of OTOC’s Immigration Action Team to ask candidates for US Senate and House a question about immigration. Action Team Leader Dave Pedersen asked candidates what they would do to push for comprehensive immigration reform if they were elected to Congress. He also asked that if substantial reform appears to be impossible in a gridlocked Congress, whether they would support Executive Action by the Administration to extend deferred action to adults with long history of living in the US without legal problems and with many ties to the community. On November 8, from 8:00 am to Noon at First UMC (7020 Cass), OTOC leaders are also encouraged to attend an engaging forum sponsored by the Poverty Education and Action Team of First United Methodist Church.